Churchill failed. The government policy remained one of appeasement. The nation was not roused. Six months later was Munich. And then, a year later, war. This week, for the first time since President Obama abandoned, after his reelection, the traditional bipartisan and international policy of pressuring Iran to abandon its nuclear weapons program, the United States Senate will have a sustained debate on the administration’s Iran policy. For the first time! The op-ed pages and the journals have been full of arguments about the path the administration has been proceeding down. Indeed, what’s remarkable is how many serious observers, including many sympathetic to the notion of a negotiated deal with Iran, have been critical of the administration’s repeated cascades of concessions. But Congress? No. The administration has succeeded in averting votes on various pieces of legislation, and therefore in preventing a real and sustained Congressional debate on its Iran policy. So the elected representatives of the American people haven’t weighed in. Now they have a chance to do so. The occasion is the Corker-Cardin bill, reported out of the Senate Foreign Relations Committee, which establishes a process for congressional review of whatever deal the administration reaches. It’s a toothless bill, setting up a process which allows Congress, in reaction to a deal, to stop the president from waiving or removing sanctions on Iran—which is of course something Congress could do in any case, at any time. So the bill sets up a process that allows Congress to do something they can do without that process. There is no reason to think that passage of this bill, as it now stands, significantly increases the chance of reversing such a deal once it is agreed to. There is every reason to think, if the bill passes without serious debate, that it will have the opposite effect—of giving the illusion that Congress is really doing something to stop or slow down a bad deal when it is not. So as it stands, the bill is at worst misleading, at best toothless. But there will be efforts on the floor of the Senate to implant teeth in the legislation’s clammy gums. Various senators are planning to offer amendments specifying what provisions would need to be in a deal to make it worthy of congressional support. These amendments range from requiring that Iran stop denying international inspectors access to certain sites, to insisting Iran stops spinning centrifuges at such sites, to making sure that sanctions relief is gradual and based on Iranian behavior rather than immediate and based only on Iranian promises, to requiring that Iran stop engaging in terror against Americans or supporting attempts to destroy Israel. Some of these amendments will be more important or more usefully targeted than others. But they each need to be considered, and debated, and voted on. 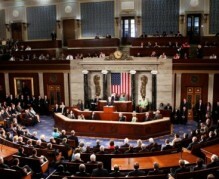 Such a Senate debate, and votes, could put the administration—and the Iranians—on notice as to what Congress would and would not accept, so Congress would not be in the position of having to overturn later an agreement entered into by the executive branch with a foreign government because of objections that have not been clearly stated in advance. It could also clarify what is at stake in this deal—not just the status of Iran’s nuclear program and the sanctions on Iran, but the broader question of Iranian hegemony in the Middle East and the likelihood of a regional nuclear arms race. It could rouse the nation to a serious consideration about the stairway we are, under the guidance of the Obama administration, descending. Nothing would be more natural for the United States Senate to have, over the next few weeks, a full and detailed debate about our Iran policy. But nothing is more impressive than the forces now arrayed against such a debate. Not just the Obama administration, but the Republican chairman of the Senate Foreign Relations Committee and the leading establishment pro-Israel lobbying group, all prefer quiet acquiescence to and approval of a toothless bill rather than a serious debate and series of votes over our Iran policy. The administration would of course be happy never to have such a debate. Some in Congress have invested so much in the process envisioned by the legislation that they can think only of having the process ratified, something they think would be endangered by a substantive debate. Some outside Congress think it crucial to have an overwhelming vote for a toothless bill; it will, they seem to believe, be easier to rally support against a bad deal later by minimizing Congressional debate about what would constitute a bad deal now. We, on the other hand, think it is very much in the nation’s interest to have a full and free congressional debate. Amendments should be considered carefully, debated thoroughly, and voted up or down. And if this takes more than few days, so be it. There is, after all, no urgency to pass the current version of the Corker-Cardin bill—even it were to deserve passage—because nothing in it takes effect until after a deal is inked, which is a couple of months away. On the other hand, what is urgent is a congressional debate on the provisions of an Iran deal. So let amendments be offered. Let votes be taken. Let the debate be engaged. Perhaps the nation can be roused. Perhaps a nuclear Iran can still be prevented without military action. Perhaps future wars in the Middle East can be made less likely. Perhaps Congress can step forth and halt our descent down the broad stairway that leads to a dark gulf.